Slate Roof Central Message Board: Help!! Repair or Replace?? What decision did you come to ?? Unless that slate is soft and rotted, I see no reason to tear it all off. I think 100% it could be fixed for a lot less than what they are talking about to replace it. When they do replace it, how long is it supposeed to last? 10-20 years? 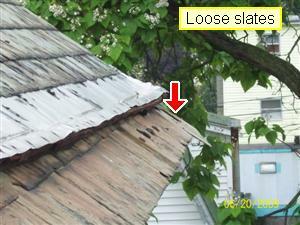 If it is fixed right, the "old" slate roof will still be in good shape at that time! I'd want out of that contract immediately unless the sellers were willing to kick in 20 K for help with fixing that roof . 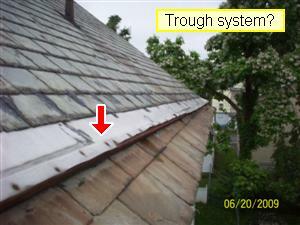 Another factor might be what access you have to the underside of the roof and what use you plan to make of the attic. If you can get up there frequently to check for leaks, and you're just storing old stuff in the attic that won't be hurt that much by a few small leaks, you may be able to keep the old roof for a while longer. First, let me say that I am NOT a professional roofer. I am an amateur who has been studying this stuff for about 9 years, and have been working on re-slating my own (30 square) roof little by little as time permits. With that said, your roof looks to be in better shape than mine was 9 years ago. My sense with a roof like this is that you can really go either way. 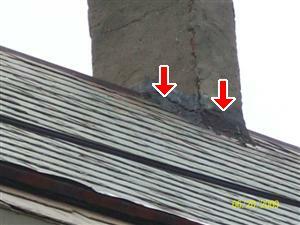 You could probably limp along for another 10, 20, 30 years patching leaks and replacing slates here and there. Or you could tear it off and replace it. The problems with putting off replacement are twofold: 1) aesthetics-- the roof is starting to look kind of ratty, and 2) it becomes harder and harder to fix one slate without breaking surrounding ones, and a lot of roofers don't want to do band-aid fixes like this. After 150 years you are pretty much coming to the end of the life of almost any roof. As slate_man said, the condition of the nails is also critical-- in fact, that might be the deciding factor if it were my roof. If they used copper nails, you may be OK for quite a while longer. 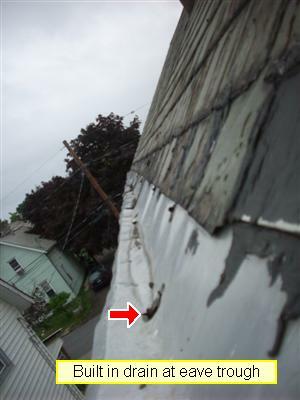 If, as with my roof, the nails are steel and rusting badly, so that the slates are prone to sliding out at the slightest impact, then I would say replace the roof soon. Thank you for responding Slate Man! I think what you're saying is that the slate itself looks ok, but the flashings are in bad shape and the nails might not be holding up (they are 150 yr old nails). So is your opinion replace?? I would want to do an on site visit to look at the roof, but slate is not that bad. The flashing needs the most work chimney cap and metal shirt from the pictures. There are some details that may not be correct and would need to be looked at in person to determind what to do. Then there is the question of how well the nails are holding up? I would say there more then a slate repair to get the roof to par. 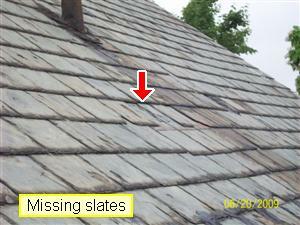 It seems that this is the place to go for slate roofing advice and I'm really hoping someone can help me. I am trying to purchase a 150 year old home in upstate NY. The slate roof failed inspection and we're in the process of trying to hash out seller concessions with the current owner. I had someone highly recommended do an estimate and he told me the whole roof needs to come down. 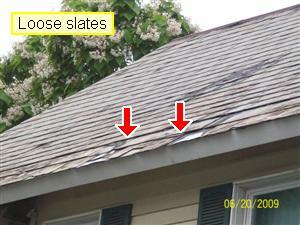 There's at least 30 slates that are loose, cracked or missing, a lot of tar from bad repairs and the flashing is worn out. The seller had someone do an estimate and said that it should be repaired and quoted a price for 25 new slates (plus labor). I'm really at a loss. Everything I read says repair when possible, but I know it hasn't been maintained well and it's probably coming to the end of it's useful life (I think it's VT slate, but I'm not sure). If it's just 30 slates (plus some of the ones around them), then I would think I'd repair. But is the roof at the end of it's useful life? 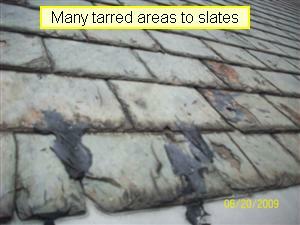 What about the tar - does it cause damage to other slates or structural problems or is it just ugly? I'm attaching pictures below (they aren't great, but they're the only ones I have). If anyone has any opinions I would really really appreciate advice! !ASAP if possible since I only have a few days in my contract to come to a decision. Thank you!!! !